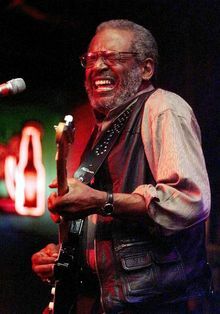 BALTIMORE (AP) — Wendell Holmes, the guitarist, pianist and singer and songwriter of the soul and blues band The Holmes Brothers, has died. Paul Kahn, Holmes' manager, says the 71-year-old musician died Friday at his home in Rosedale, Maryland. Kahn says Holmes died of complications from pulmonary hypertension. Holmes and his older brother, bassist Sherman Holmes, played churches in Virginia when they were growing up, and after high school, played professionally in New York. Drummer Willie "Popsy" Dixon started working with the brothers and they played the bar circuit. The three formed The Holmes Brothers in 1979. Kahn says Wendell Holmes was a natural musical talent, and said his most popular song was the soul ballad "We Meet, We Part, We Remember." From family to family sending our deepest Sympathy and Condolences for your loss.